A couple of weeks ago Samsung officially announced that the Galaxy S7 edge will be coming in the popular Blue Coral color which debuted on the problematic Galaxy Note 7. 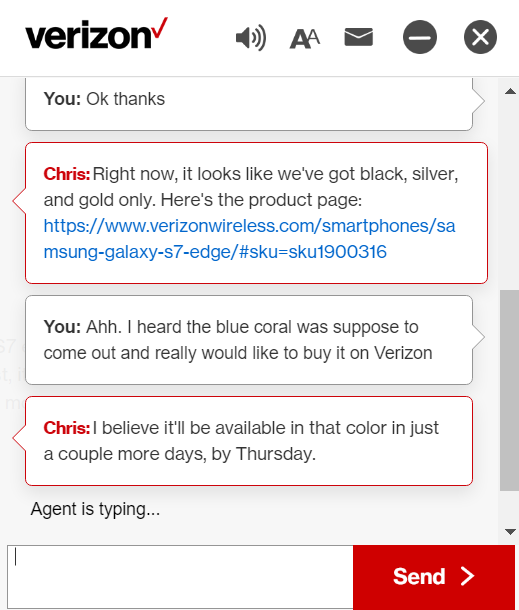 Today, we did some digging and confirmed the release date on Verizon Wireless. According to an online representative, Big Red will release the Blue Coral version of the Galaxy S7 edge on Thursday, November 17th. The release date makes sense as the carrier would like to capitalize on the sales leading into Black Friday weekend. To sweeten the pot, Verizon currently has an excellent promotion going on. If you buy a Galaxy S7 edge, you will get a second one for half off on device payment. The Galaxy S7 edge is currently $33 a month on device payment, which would make the second one $16.50 a month with this promotion. This is a fantastic promotion to take advantage of especially for who want to get their hands on the gorgeous new color. AT&T is already taking pre-orders for the Galaxy S7 edge in Blue Coral while T-Mobile is expected to release it on November 18th. It’s good to see that Verizon is coming out with it too, after all, the very first leaked image of the Blue Coral Galaxy S7 edge proudly carried Verizon’s logo.